This page includes the postcards showing Irish Sea Shipping in Geoff Topp's collection. Other than re-organisation, and the addition of notes, the content is the same as when published on the Merchantnavyofficers.com website. Ben-my-Chree means 'Girl of my heart' in the Manx language and has been a favourite for vessels owned by the Isle of Man Steam Packet Company which has given this name to no less than six ships; this was the second of them. She was a 2,651 GRT steam turbine engine passenger ship completed for the Isle of Man Steam Packet Co. Ltd. in 1908 by Vickers, Sons & Maxim at their Barrow yard. She was 147 metres long with beam 17.8 metres. Her triple screws could propel her at 24 knots and she could accommodate 2,549 passengers on her five decks and was used on the Liverpool to Douglas service. During WW1 she was converted to a seaplane carrier and fitted with four 12-pounder and two 3-pounder guns. She was sunk by shellfire from the Turkish army off Kastelorizo on 11 January 1917. The wreck was raised in 1923 and broken up. Caledonian Coast believed to be from approximately 1960. Caledonian Coast was a 1,265 GRT diesel engined cargo ship completed for Aberdeen Steam Navigation Co. Ltd. in 1948 by Hall, Russell & Co. at their Aberdeen yard. She was 84.4 metres long with beam 12.3 metres. Her twin screws could propel her at 14 knots. 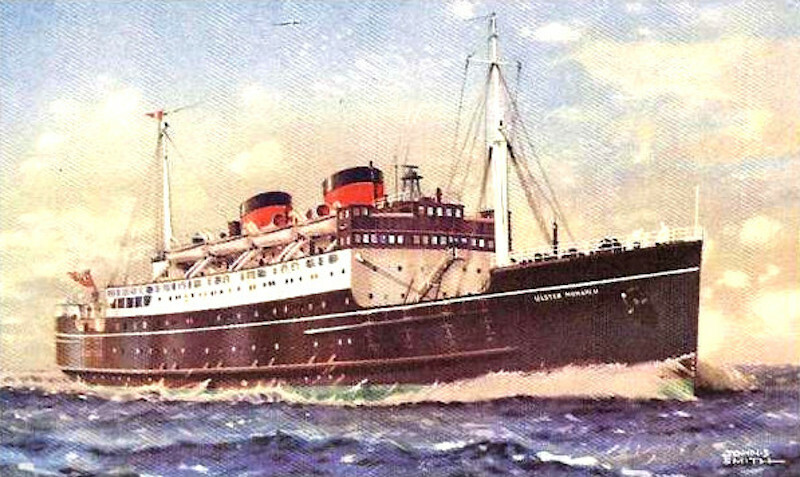 She was sold to Coast Lines Ltd. in 1948 and renamed Makalla in 1967, sold to Alomar Mechanical Engineering Co. in 1968 and renamed Ahmadi Coast and to Kuwait Coast Line Co WLL in 1970. She was broken up at Cartagena in 1974. Empress Queen arriving at Douglas, Isle of Man. The decks seem dangerously crowded by today's standards. Empress Queen was a 2,140 GRT compound-engined paddle-driven passenger ship completed for Isle of Man Steam Packet Co. Ltd. in 1897 by Fairfield Shipbuilding & Engineering Co. at their Govan yard. She was 109.8 metres long with beam 12.9 metres and her twin paddles could propel her at a remarkable 21.5 knots. She was the first paddle steamer fitted with wireless telegraphy in 1903 and served the route from Liverpool to Douglas. In 1915 she was requisitioned for use as a troopship in WW1 and deployed on moving troops from Southampton to Le Havre. On her return trip on 1 February 1916, with 1,300 troops on board, she ran ashore on the Ring Rocks near Bembridge Isle of Wight but fortunately there was no loss of life. The vessel was broken up by the tides and weather over time. Hibernian Coast - believed to be from approximately 1960. Irish Coast. The date and location are not known. Irish Coast was a 3,824 GRT diesel engined passenger/cargo ship with refrigeration completed for Coast Lines Ltd. in 1952 by Harland & Wolff at their Belfast yard. She was 97.7 metres long with beam 15.7 metres and her twin screws could propel her at 17 knots. She was sold to Epirotiki SS Nav Co "George Potamianos" Ltd. in 1968 and renamed Semiramis II in 1969, then to Epirotiki Lines SA in 1969 and renamed Achilleus and in the same year renamed Apollon II, to Corp Naviera Intercontinental de Panama SA in 1981 and renamed Regency and finally to Triton Holding Corp in 1982. She was wrecked at Batangas on 11 October 1989 whilst laid up and broken up at Manilla. Steam yacht Killarney. The date is not known. Killarney with her previous name Magic. The date is approximately 1904. I have been unable to identify for sure the details of this vessel. She could be the same one included in The Allen Collection HERE as Killarney Coast - though the photo actually shows the name on the side of the vessel as Killarney. If so she is from 1893 and built by Harland & Wolff. 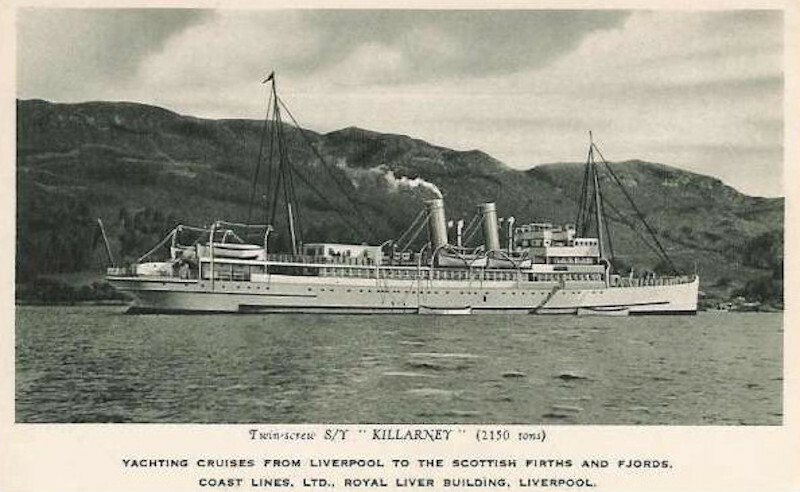 Killarney was a 2,081 GRT triple-expansion steam engined passenger ship completed for Belfast Steamship Co. in 1893 by Harland & Wolff at their Belfast yard as Magic. She was 94.9 metres long with beam 11.7 metres and her twin screws could propel her at 17 knots. 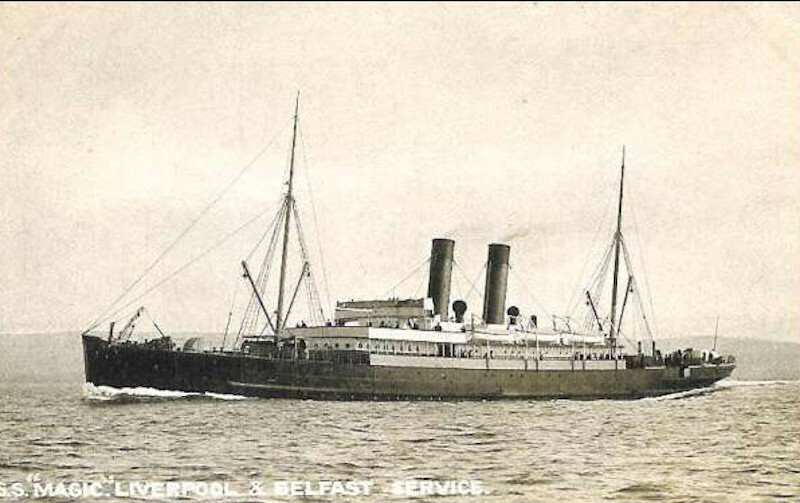 She served the Liverpool to Belfast route initially. She served as a hospital ship during WW1 as HMS Magic and later HMS Magic II due to another vessel of the same name, and later Classic. She resumed her previous service from 1919 retaining the name Classic and was later converted from coal to oil, transferred to City of Cork Steam Packet Co. and renamed Killarney. In 1930 she was converted into a "cruising yacht" and used for tours from Liverpool to Scotland until the outbreak of WW2. She was used in some manner during WW2 and in 1947 was laid up until sold to Epirotiki Lines and renamed Attiki. She was wrecked on 6 October 1951 at Falconera Island. 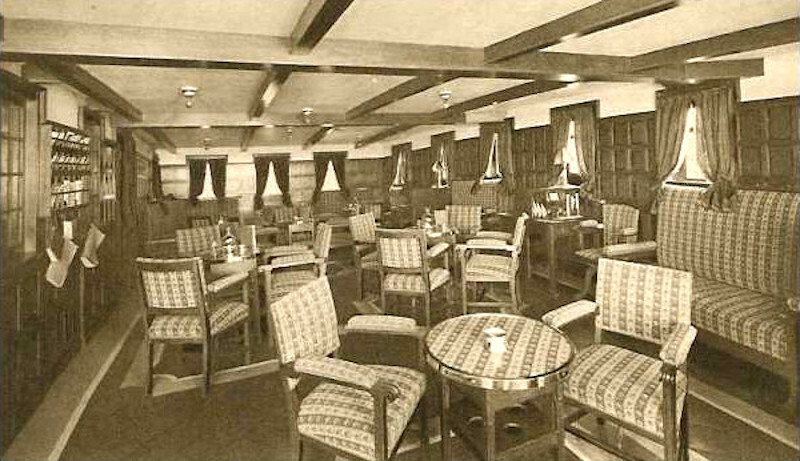 B & I advertisement and showing the Lounge aboard Lady Limerick. This vessel was completed in 1924 by Ardrossan Dockyard and Shipbuilding Co. for B & I and sold to Burns & Laird Lines Ltd. and renamed Lairdscastle in 1930. 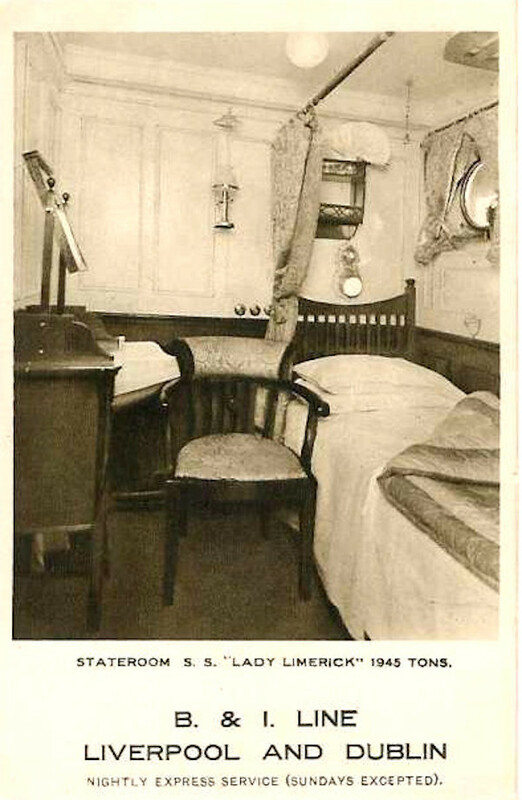 Stateroom of Lady Limerick from the same advertisement. Lady Limerick was a 1,945 GRT triple-expansion steam engined passenger/cargo ship completed for British & Irish Steam Packet Co. Ltd. in 1924 by Ardrossan Dockyard & Shipbuilding Co. at their Ardrossan yard. She was 84.3 metres long with beam 11.5 metres and her single screw could propel her at 14 knots. 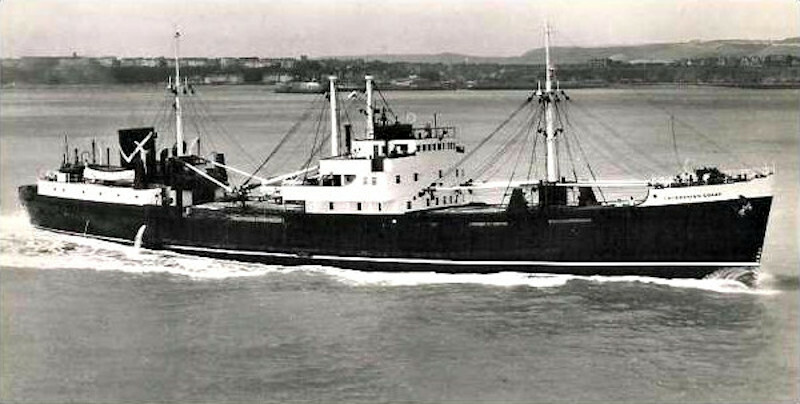 She was sold to Burns & Laird Lines Ltd. in 1930 and renamed Lairdscastle. She was in collision with Vernon City on 4 September 1940 between Cumbraes and the Mull of Kintyre and sank shortly afterwards. 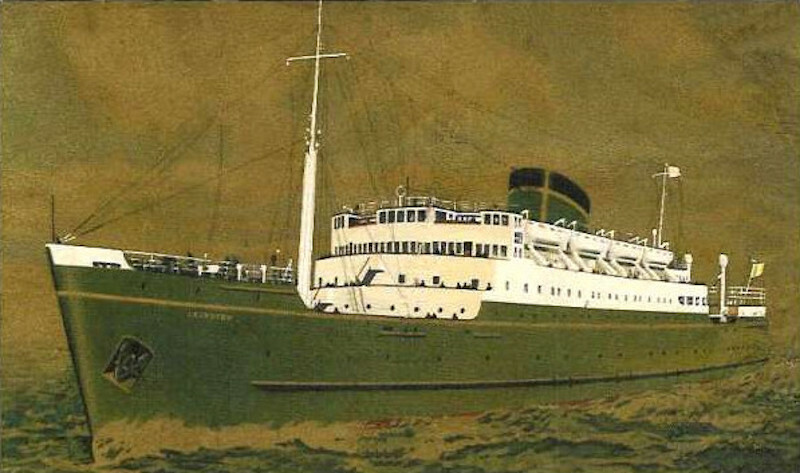 Official company postcard showing Leinster. The date is not known. 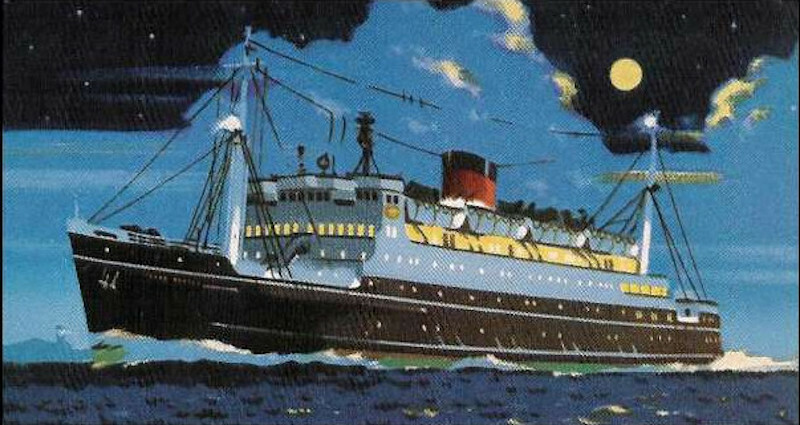 Artwork showing the ship as Ulster Prince on a night crossing from Liverpool to Belfast and is from approximately 1965. 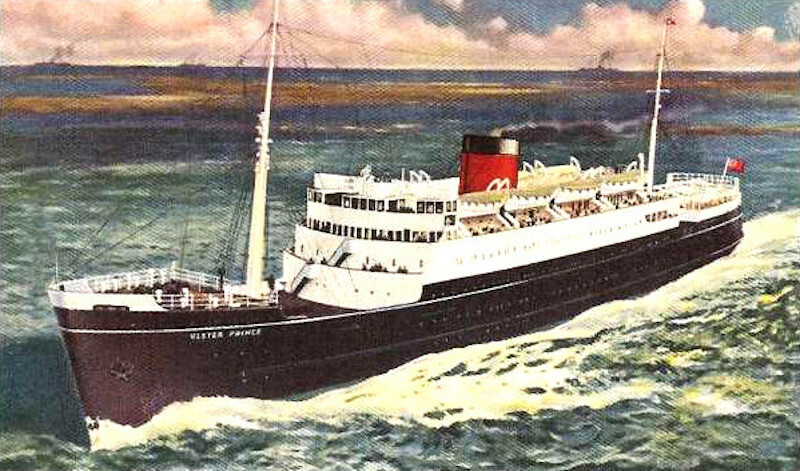 Artwork showing the ship as Ulster Prince on a crossing from Liverpool to Belfast and is from approximately 1965. 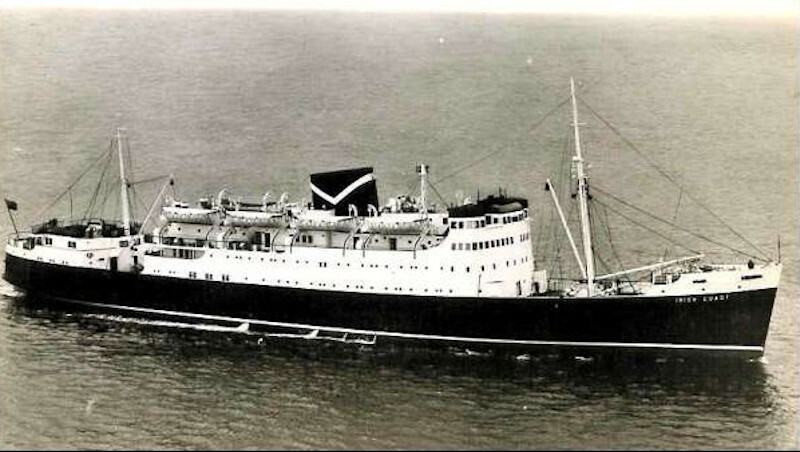 Photo showing the ship as Ulster Prince on a crossing from Liverpool to Belfast and is from approximately 1965. Leinster was a 4,302 GRT diesel engined passenger ship completed for Coast Lines Ltd. in 1937 by Harland & Wolff at their Belfast yard. She was 107.6 metres long with beam 15.3 metres and her twin screws could propel her at 18 knots. 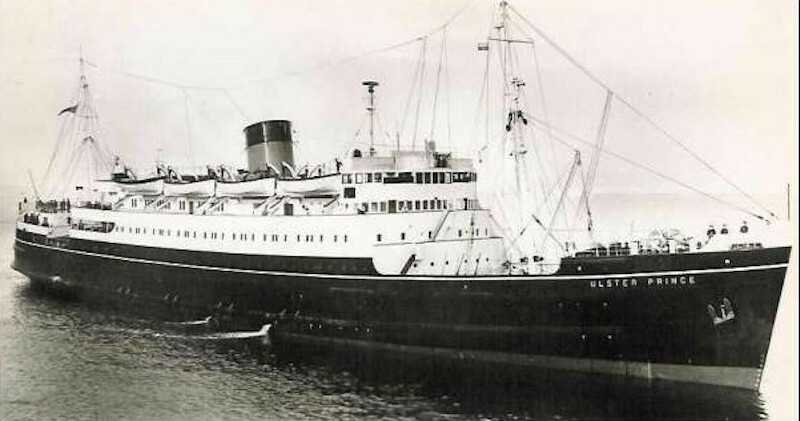 She was sold to Belfast Steamship Co. Ltd. in 1946 and renamed Ulster Prince and in 1966 renamed Ulster Prince II. 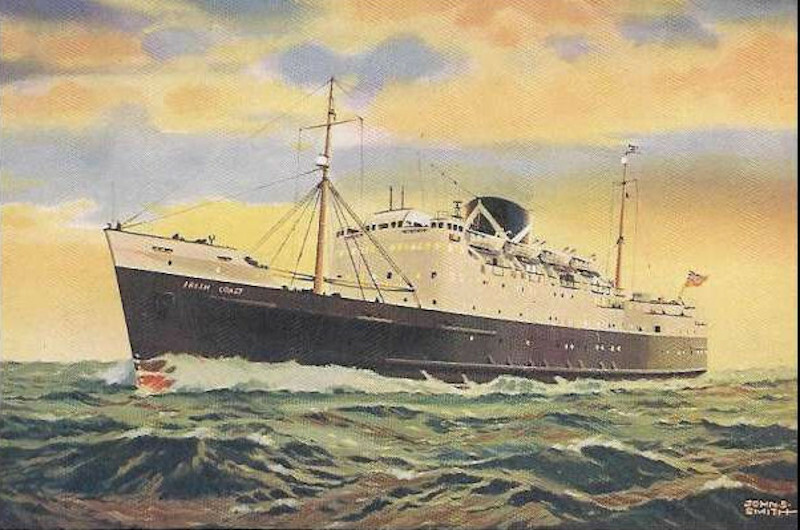 In 1968 she was sold to G.Potamianos and renamed Adria and in 1969 to Epirotiki Steamship Co. and renamed Odysseus. She was broken up at Faslane in 1979. 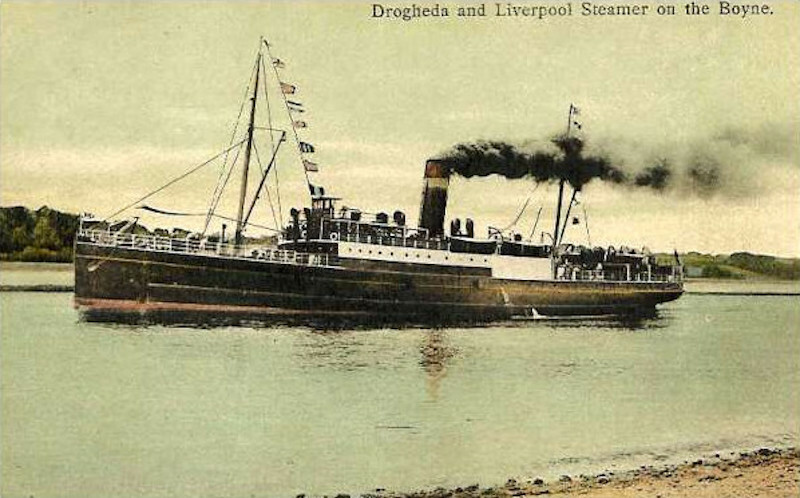 Postcard showing a steamer on the Drogheda to Liverpool service on the River Boyne. The name of the vessel and date are not recorded but see the notes below. Although the name of the ship is not recorded, on the basis of comparison with photos held elsewhere, I can say with great confidence that she is Mellifont - a 1,204 GRT triple-expansion engined steam passenger/cargo ship completed for Lancashire & Yorkshire Railway Co. Ltd. in 1903 by Vickers, Sons & Maxim at their Barrow yard. She was 79.2 metres long with beam 10.9 metres. Her twin screws could propel her at 17 knots. She passed to London & North Western Railway Co. in 1922 and to London, Midland & Scottish Railway in 1923. She was broken up at Barrow in 1932. Paddle steamer Mona's Isle.. Date not known. The Isle of Man Steam Packet Company had three paddle steamers of this name. The first which was completed in 1830 was made of wood and the first owned by the company. It was scrapped in 1851. The second was completed in 1860, sold and converted to a screw-driven vessel in 1883 and renamed. 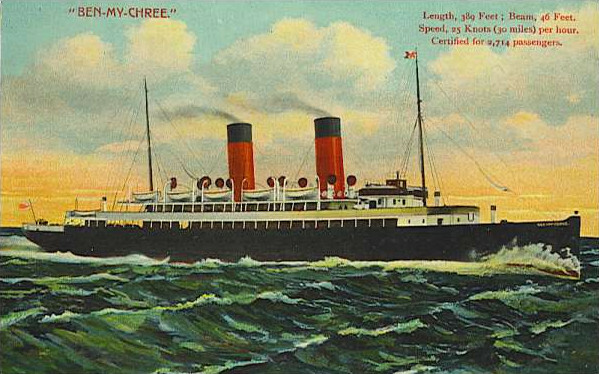 The third (as shown on this postcard) was completed in 1882 by Caird & Co. at their Greenock yard. She was 100.7 metres long with beam 11.6 metres. Her paddles could propel her at 18 knots and she was used on the Liverpool to Douglas service. She served as an anti-submarine net-laying vessel during WW1 and also as a patrol and rescue vessel. She was broken up at Morecombe in 1919. The Isle of Man Steam Packet Company had two paddle steamers of this name. The first which was completed in 1853 had just one funnel and was broken up in 1880. This would be the second which was completed in 1885. She was completed in 1885 by the Barrow Shipbuilding Company at their Barrow yard. She was 97.6 metres long with beam 9.2 metres. Her paddles could propel her at a speed of 19 knots and she was initially used on the Fleetwood to Douglas route, though later from Liverpool. She was chartered for use as a troopship in WW1 and ferried troops from Southampton to Le Havre. On the night of 16 February 1917, with 1,000 troops aboard and within and hour of Le Havre, she encountered a submarine which fired a torpedo that passed underneath without detonating. The submarine was struck on the conning tower by the steel paddle floats and it sunk immediately. 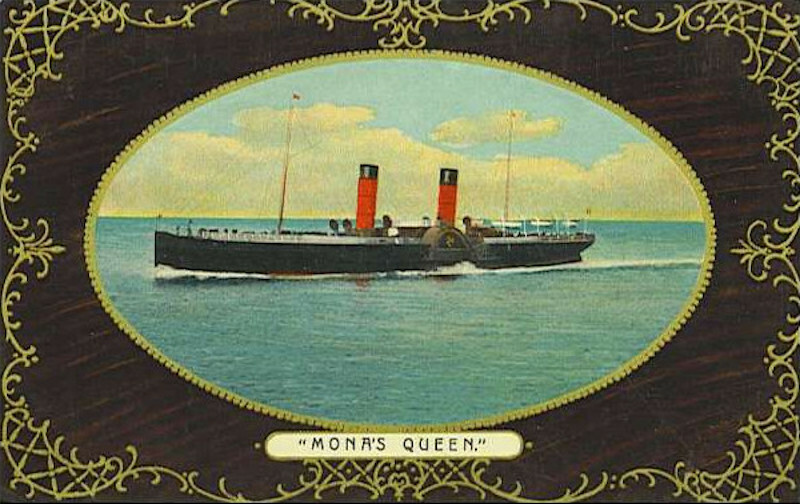 Mona's Queen limped into Le Havre and disembarked the troops before going on to Southampton for repairs and returned to her previous duties in March. 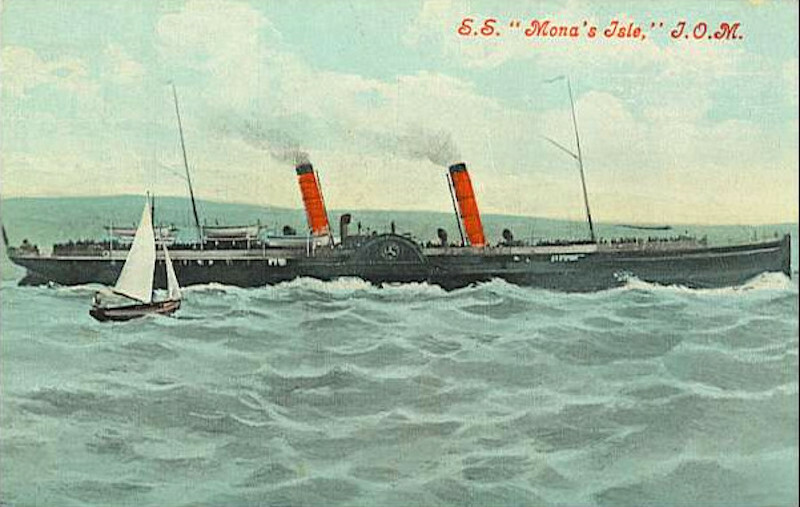 She returned to the Isle of Man service in 1920 and continued in use until 1929 when she was broken up at Port Glasgow. Ocean Coast - believed to be from approximately 1960. Ocean Coast was a 1,173 GRT diesel engined cargo ship completed for Coast Lines Ltd. by Henry Robb Ltd. at their Leith yard in 1935. She was 76.8 metres long with beam 11.6 metres. Her twin screws could propel her at a speed of 11 knots. She was sold to Anastassios M.& Angela Nomikos in 1964 and renamed Effy and to Titika Cia Naviera SA in 1967 and renamed Anna Maria. 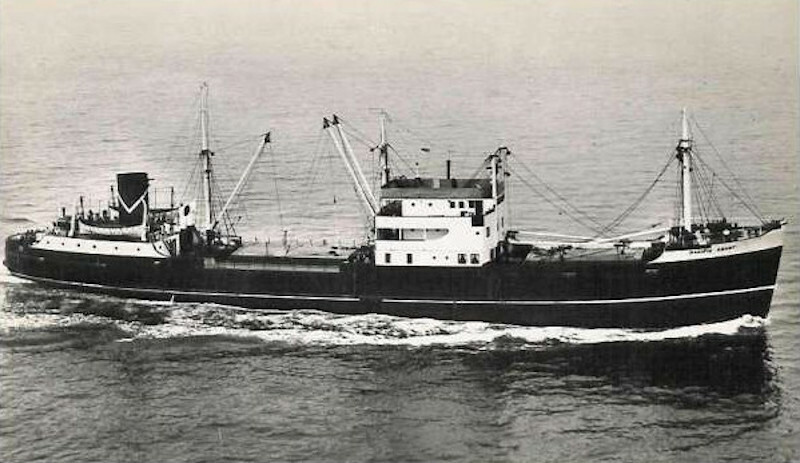 She was wrecked off Mangalia on 8 February 1969 whilst en route from Hamburg to Constanta with a cargo of bagged cocoa beans. Pacific Coast - believed to be from approximately 1960. Pacific Coast was a 1,703 GRT diesel engined cargo ship completed for Coast Lines Ltd. by Ardrossan Dockyard Co. at their Ardrossan yard in 1946. She was 81 metres long with beam 11.6 metres. Her twin screws could propel her at a speed of 12 knots. 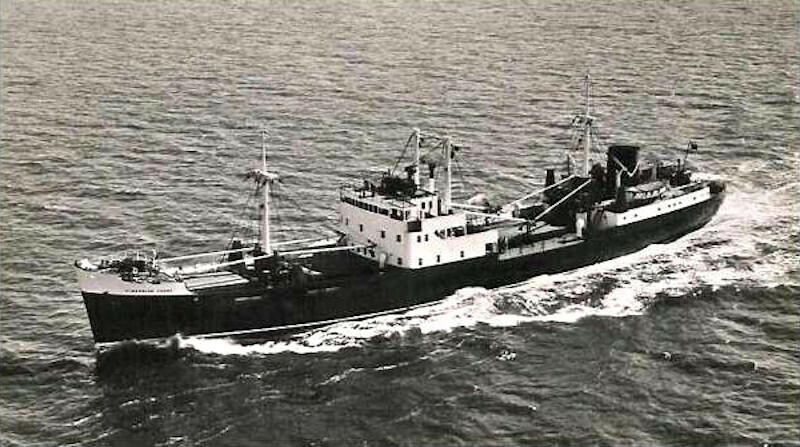 She sold to Alomar Mechanical Engineering Co. in 1968 and renamed Kuwait Coast, to Kuwait Coast Line Co WLL in 1970, to Musseib Arjumand Zayarti in 1974 who renamed her Nassar in 1976. She was wrecked at Port Rashid breakwater, Dubai on 29 November 1976 whilst en route from Abadan to Bombay whilst in ballast. 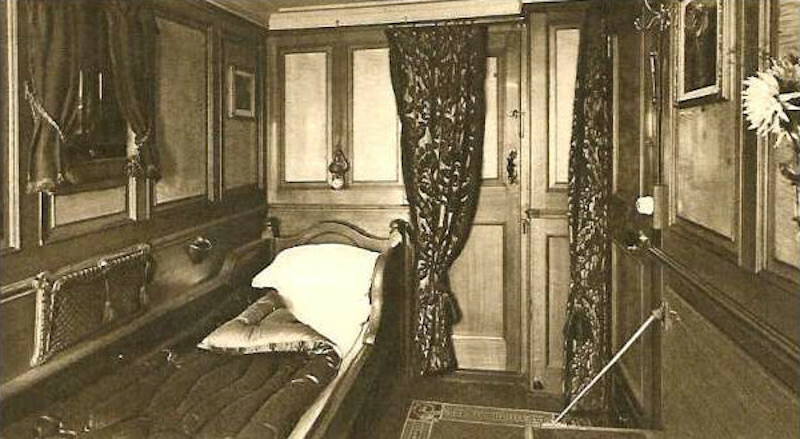 From a B and I advertisement and shows a Stateroom about the steamer Patriotic. The date is not known. 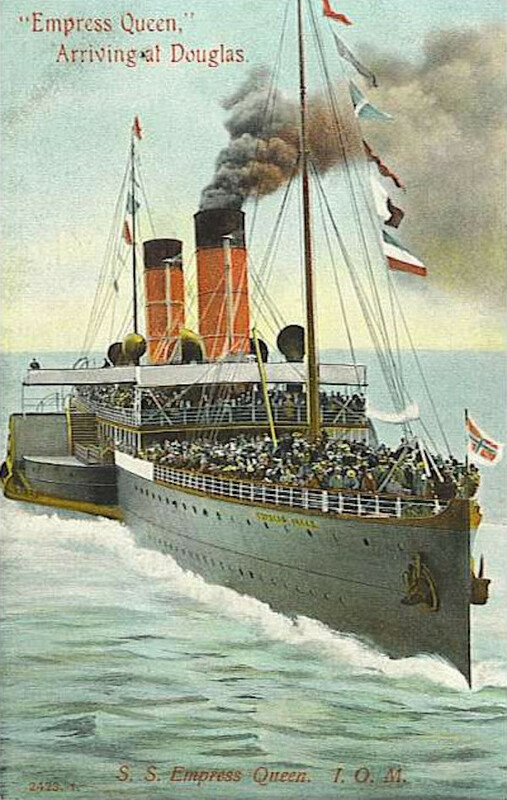 Patriotic was a 2,254 GRT triple-expansion steam engined passenger/cargo ship completed for Belfast Steamship Co. Ltd. by Harland & Wolff at their Belfast yard in 1912. She was 99.2 metres long with beam 12.7 metres. Her twin screws could propel her at a speed of 18 knots. 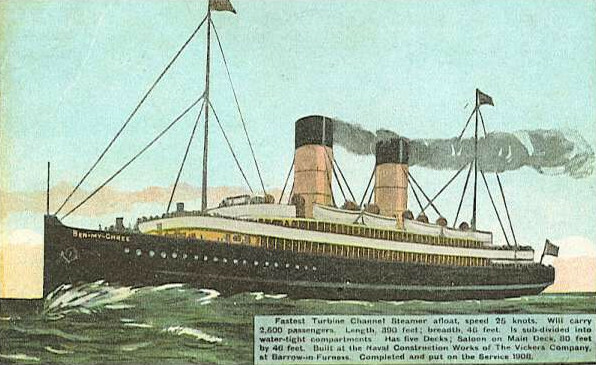 She was sold to British & Irish Steam Packet Co. Ltd. in 1930 and renamed Lady Leinster who renamed her again in 1938 to Lady Connaught, then sold to Coast Lines Ltd. in 1947 and renamed Lady Killarney. She was broken up at Port Glasgow in 1956. There is a photo of this ship in The Allen Collection HERE. Artwork showing Ulster Monarch on a crossing from Liverpool to Belfast and from approximately 1965. Ulster Monarch was a 3,851 GRT diesel engined passenger/cargo ship completed for Belfast Steamship Co. Ltd. by Harland & Wolff at their Belfast yard in 1929. She was 105.5 metres long with beam 14.1 metres. Her twin screws could propel her at a speed of 16.5 knots. She was requisitioned for WW2 and served as HMS Ulster Monarch as a Landing Ship, Infantry (LSI) after conversion and returned to normal duties in 1945. She was broken up at Ghent in 1966. Western Coast in port from approximately 1919. 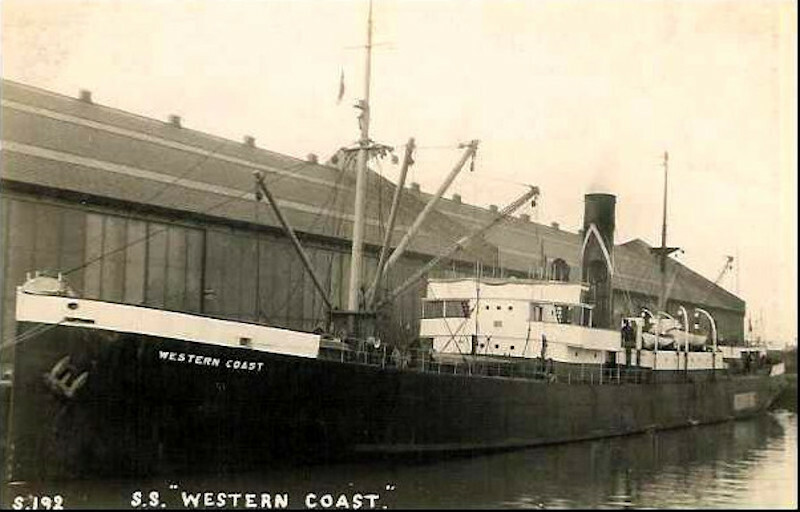 Western Coast was a 1,928 GRT triple-expansion steam engined cargo ship completed for Coast Lines Ltd. by Swan, Hunter & W.Richardson at their Southwick yard in 1919. She was 88.4 metres long with beam 13 metres. Her single screw could propel her at a speed of 10 knots. 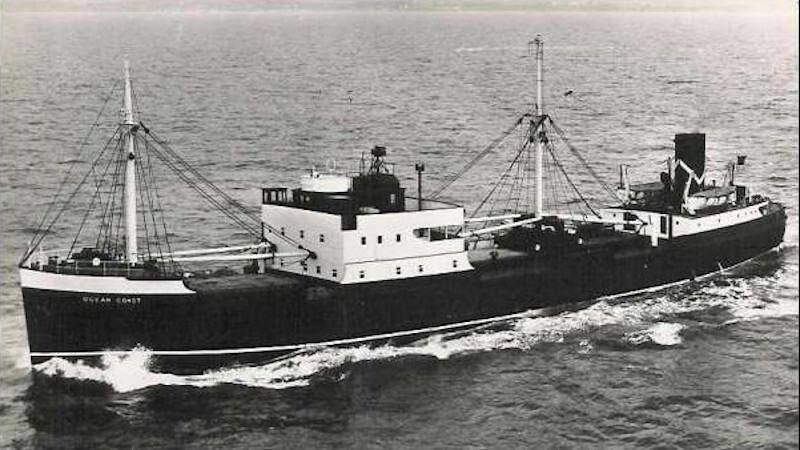 She was sold to Moss Steamship Co. Ltd. in 1922 and renamed Esneh, to James Moss & Co (Moss Line) Ltd. in 1930, to Moss Hutchinson Line Ltd. in 1934, to Olympus Nav Co. Ltd. in 1948 and renamed Tefkros, to Winly Nav Co. Ltd. in 1951, to Shun Kee Nav Co. Ltd. in 1954, to Choon Kee Nav Co. Ltd. in 1955 and renamed Shun On in 1958. She was broken up at Hong Kong in 1959.